A Rare Win at Old Trafford, Fantastic Fans & Welbeck Justice. New Author 14th January 2018 Arsenal, arsene, Exclusive, FA Cup, football, report, tacticsTagged away, cup, dimaria, fans, fellaini, manchester, monreal, rooney, united, welbeckLeave a Comment on A Rare Win at Old Trafford, Fantastic Fans & Welbeck Justice. No fan prior to kick off could proclaim to be wholly confident regarding the outcome of this vital Cup tie. Despite being able to finally claim supremacy regarding quality of squad, Arsenal still had a truly awful record Vs Manchester United that tainted any feelings of optimism towards a positive result. Seeing as the last triumph the Gunners had earned at the home of Utd was in 2006, a match at Old Trafford that held the last remaining and realistic chance for silverware was one that would test every available nerve. Upon viewing the game, this was so very true. First and foremost, every one of the 10000+ fans that made the arduous and awkward sojourn to Manchester on a Monday could be heard as clear as crystal. Not only commendable for the travails they had to traverse, but also the way they represented the club by bursting into song throughout the 90 minutes made goosebumps appear at regular intervals. The BBC were to blame for the ridiculous fixture arrangement but it mattered not. A first class showing and the result was just reward for the away fans effort. The first half resembled two boxers who had fought previously and therefore were wary. Jabs from range and sizing each other up were the order of the day but Arsenal went on the offensive before the home team. Oxlade-Chamberlain seemed fired up and went on a mazy run but the criticism that has followed him around this season – a lack of end product – showed up once more. 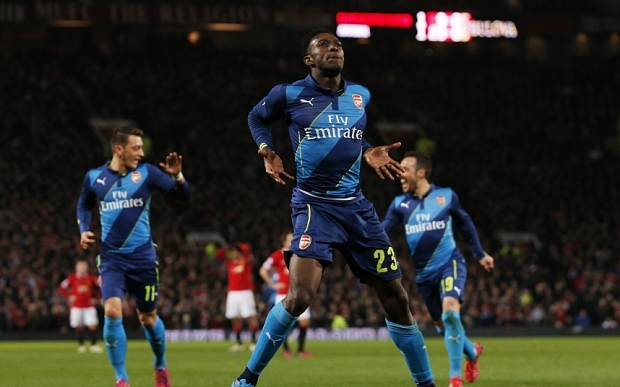 A half hearted penalty appeal from Danny Welbeck aside, this was the spoils of the first 25 minutes. Then, the Arsenal machine finally kicked into gear which resulted in a fine move which Nacho Monreal converted past De Gea in a comprehensive fashion. Three minutes later, Utd equalised. A fine cross eluded Koscielny’s head and who else but Wayne Rooney, the bane of Arsenal, headed past a prone recalled Szczesny. It appeared that Wojicech could have done more but it was a bullet header in fairness. Both clubs carried threat. United were pumping balls into the range of the lanky Belgian Fellaini who won most of his aerial duels and attempted to link up with Rooney, with a dangerous Di Maria in tow. Arsenal carried pace up top due to Welbeck being chosen ahead of an in-form Giroud with Sanchez playing well in support. The game was finely balanced. The fact that the loser of this battle would find themselves out of a cup they both so dearly needed to win was the one restraint that stopped the pace of the game raising. The second half brought with it two changes from Van Gaal. United supporters remain unconvinced regarding his grasp of tactics required to unlock Premiership defences and the introduction of Jones and Carrick didn’t exactly warrant a change of opinion. Early in the second half, the dangerous Chamberlain tweaked what appeared to be his hamstring and Ramsey was brought on to replace him. We all now know the result and how it came about. It is so often the case that a former player comes back to plague their former employers and Welbeck, with his huge efforts, deserved to be the man who plundered what was the winner. Danny Welbeck, who Van Gaal proclaimed to be ‘ not Utd quality’ served up a wonderfully poetic reminder to all at his former club that they perhaps miss his presence this season. With a misfiring Falcao and a regularly crocked Van Persie – Welbeck would have surely prospered if given the opportunity. He has been given a chance, at The Emirates – and thus far has justified his inclusion each time. It was also refreshing to witness him celebrate so vociferously. So often, a player will refuse to celebrate or offer a muted effort, but Danny Welbeck let rip his frustration and joy in equal measure. It was so transparent to see what it meant to him and his teammates were more than happy to share his joy. Di Maria continued his dire run of form with a booking for diving and then manhandling the referee, which promptly saw him given a red card. This pretty much summed up his season so far which has been frustrating. Januzaj was another substitute sent on by Van Gaal and he also was booked for simulation which is a telling clue. Instead of attempting to continue and force a save from the keeper, the young Belgian threw himself to the floor. Confidence is at a premium in the attacking department at Old Trafford and it was evident once Januzaj opted for the easy choice of falling to the turf even though he had run clear of Monreal. Even though United carried a threat going forward on their rare forays away from the stale possession football they have adopted under Louis Van Gaal, stilted movement and a heavy reliance on the Fellaini/Rooney combo with only fleeting glimpses of the raw danger the Utd attack could possess if unlocked was what was offered to the Utd faithful. United more and more went to the tried and tested method of lumping it toward the lump of hair that is Fellaini. The hirsute Belgian had an effective game but his touch is ever-bereft and the finer nuances of the game are but a stranger to him. The gameplan that Utd resort to when he is on the field showcases a huge difference as to what fans are used to and expect. Red Devil fans may point to a great chance for Smalling to equalise, Michael Oliver making ill-advised decisions and other reasons as to why they may have deserved more out of the game, but Arsenal more than deserved another trip to Wembley. This may have also been a watershed moment. This ended the excruciating run of matches without a win for Arsenal against Manchester United and may have lifted a cloud that only settled on visits to Old Trafford. Arsenal more than matched them in each department and a healthy mix of industrious defending and bustling attacking reaped the spoils. Arsene has masterminded his clubs passage to the Semi-Final and also maintained their ownership of the Cup for the time being. Kudos must go to him for his selection. The away fans that sang their hearts out and leaped over the obstacles placed in front of them by the BBC deserve the lion’s share of the plaudits though. This result will keep them awake as they struggle through the next day at work. A fine showing from the team on the pitch and the fans in the stands. Man Utd Cup Tie – It all hinges on this….